Instead of sharing the same information over and over ( I mean how many times can you write about Fibro Fatigue) I suggest breathing some new life into your ancient posts, if like me you have been blogging for a while. This will get readers into your valuable articles that they may not have seen that are still relevant to them today. Firstly I look through my blog's archives and decide which ones I will revamp. There is no correct way to do this, it is completely up to the individual. Some people choose their most popular post and some people choose their most unpopular articles with the least visits. I choose content that can be considered timeless or evergreen and by this I mean that the topic is relevant, was relevant and will continue to be relevant to a group of people e.g. What is Fibromyalgia? Timeless content is not the latest news or the latest trends, it can be How To do something e.g. How To Fight a Fibro Flare; Tips such as 10 Tips to using Aromatherapy to Reduce Pain. 1. READ IT: Spend some time re-reading your old post. Look at it like a first time visitor to your site. Imagine this is the very first post of yours they have ever read. Is it clear? Does it provide valuable information to the reader. Is it simple and specific or does it wander all over the place (like some of my earlier posts). 2. UPDATE INFO: Is there anything you can update to make it more current - information, statistics, dates. 3. SPELLING: Are there spelling or grammar errors? Check now. 4. VALUE: Is there anything you can add to make it more useful to your readers? e.g. an infographic or graph; links to other relevant sites; is it too short and requires more content? 5. IMAGES: Can you add or change an image to make it more appealing or more shareable? or more PINNABLE? a) Consider where you would usually share your posts or like your posts to be shared e.g. 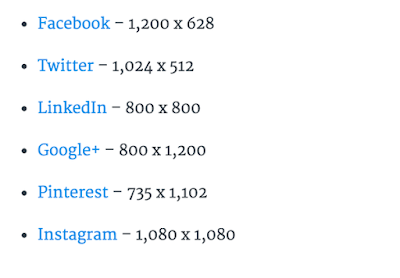 PINTEREST, facebook, twitter, Instagram etc and size your image to suit that social medium. b) Have you thought of branding your photos? Don't forget to add the keyword, alt tag and file name behind the scenes to make the image more searchable. 6. LINKS: Check all your links to make sure they are not dead. Remove/change dead links. Link this article to a relevant other article of yours to keep the reader delving into your posts. 7. READABILITY: Make it easier to read. Does it need a larger font? Most people find 16 an easily readable font size but it does depend on the font you are using as some are naturally larger. Does it need smaller paragraphs and more white space? People find it easier to read sort paragraphs rather than long blocks of text. 8. TITLE: Does the title need changing? Can you make it a better one so that it has a keyword or phrase that might be used by someone searching for information OR can you make it more intriguing a title to be shared on social media to get people's interest and make them click over? invite a comment about your post: Be very pointed about asking for comments - ask for peoples opinion ask for an example of things. 10. COMMENTS: Check out your comments section. Are there some you need to respond to? Are there some spammy ones you can delete? 11. SHARE: Share your revamped post on all your social media now. Schedule it to re-run on your social media. 12. YOU CAN SHARE THIS OLD POST AT FIBRO FRIDAY it is a great way to get more visitors to your valuable and often hidden posts. 13. EMAIL: Send an email to your subscribers and let them know about your post. Have I forgotten anything? 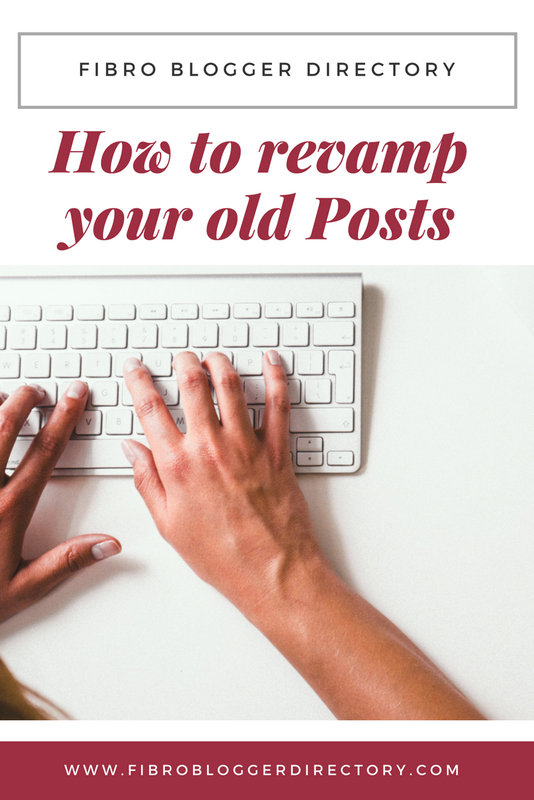 Have you been revamping any of your old posts? i would love to hear about it. This is a great idea that I just did not have time for. with these point by point steps it becomes easier. Good to hear this Clarry, I was hoping it could simplify the process. Thanks for letting me know. As a fairly new blogger, this is great information for me for the future! Or click Blogging Help or Blogging Ideas in the TOPICS List in the right hand side bar. CONNECTING the fibro blogging community, inspired by all the fibro bloggers and their stories. Empathy is only a few clicks away. At Fibro Bloggers Directory you will find interesting blogs where you can get first-hand information from others going through the same experiences.